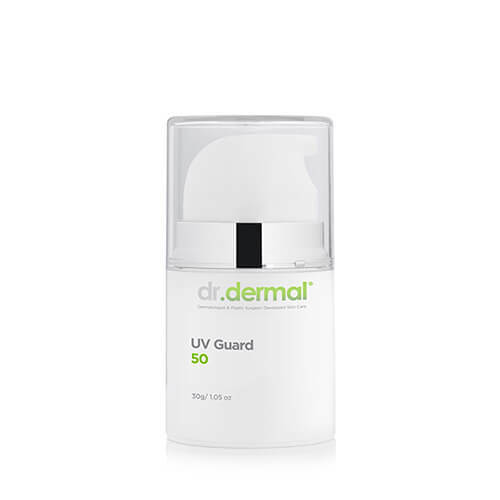 dr.dermal’s UV Guard 50 is a broad spectrum anti aging sun protection cream that has been clinically tested on sensitive skins and is water-resistant. 80% of all visible aging is caused by sun damage so a high factor SPF is the first line of defense in an anti aging skin care routine. UV Guard 50 protects against both UVA and UVB rays with a SPF of 50. UVA rays penetrate deeper into the skin and without protection these are responsible for premature aging, loss of elasticity, wrinkling and interruption of the skins immune system. UVB rays burn the superficial layers of the unprotected skin and are partially responsible for the development of skin cancer. Our UV Guard 50 is dermatologist tested for use on sensitive skins, is water resistant so it’s a perfect partner for those with an active lifestyle. It’s also hydrating and nourishing enough to be used as a moisturizer for normal skins. I use this UV guard every single day to protect my skin from the sun. It is the best I have found to absorb quickly into the skin, which allows me to apply my makeup straight afterwards with no problems at all. I use this daily under makeup. Such a great formula…non greasy and feels lightweight on the skin. I am a runner and spend a lot of time in the harsh sunlight. This product is fabulous as it does not wash off if you sweat profusely. Highly recommend it to sports people and the service you get from Dr Dermal is phenomenal! Apply to clean, dry skin and allow sufficient absorption to ensure maximum protection. Aqua, C12-15 Alkyl Benzoate, Ethylhexyl Methoxycinnamate, Octocrylene, Butyl Methoxydibenzoylmethane, Benzophenone-3, Caprylic/Capric Triglyceride, Potassium Cetyl Phosphate, Glycerin, Titanium Dioxide (Nano), Cyclomethicone, Triacontanyl PVP, Methylene Bis-Benzotriazolyl Tetramethylbutylphenol, Glyceryl Stearate, Isohexadecane, Aluminium Stearate, Sorbitan Stearate, Phenoxyethanol, Hydrolysed Collagen, Polyhydroxystearic Acid, Peg-100 Stearate, Carbomer, Decyl Glucoside, Tocopheryl Acetate, Alumina, Disodium EDTA, Sodium Hydroxide, Ethylhexylglycerin, Propylene Glycol, Xanthan Gum. Q: Is this product suitable for sensitive skin? A: Yes, our UV Guard 50 has been dermatologist tested safe for sensitive skin. Q: Is this broad spectrum protection? A: Yes, our UV Guard uses both physical and chemical UV absorbers to cover a broad spectrum of UV light, and offers high protection. Q: Can it be used by sportsmen and women? A: Yes, this product is water resistant and is suitable for use during sports. Q: Will this product leave a white residue on the skin? A: No, this product does contain titanium dioxide, but it is in its nano-form so it is rapidly absorbed and no sheen is left visible once the cream is absorbed.